I volunteered to run a coffee stall at my schools fete coming up, and they hired a machine for me through a company theyve used a few times before. its the machine pictured below, "Piazza DOro Espressimo", and in my searching around have seen people say they think it might be a rebadged San Marino / Astoria / CMA machine. In my searching around I have also read that its a pretty lousy machine - eg here: http://coffeesnobs.com.au/YaBB.pl?num=1244714687 where Chris said it was one of the least impressive machines hes used, and scoota gal agreed. This is disappointing as obviously the reason I offered to run the stall was because I wanted to try and share good coffee with the school community rather than the ....... thats normally served. 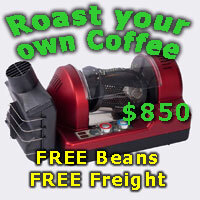 Ill be using my SJ and a couple of RR45s with good quality beans from a good roaster - I made sure I got to pick that. If the coffee is good and you execute it well, I am sure the punters will be happy. The design of these is not much chop and they frequently run pretty hot unless they have been souped up. Wouldnt have one if someone was giving em away, but it will do the job. Theyre "okay", though you gotta Keep the water flowing through them to keep them at a decent temp. Beans help a lot though, Id say that once youve got the grind dialled in, youre 90% of the way there to giving the school a darn fine coffee experience, Despite the apparent limitations of the machine. The one Ive used had a sticky steam-valve, but that might not be an indication of the machine you have before you. I need help inProgramming the Portion Buttons Espressimo Coffee Machine, two group, as I bough it second hand and the buttons release two much water. That is a 15 amp I think 2 Group Espressimo my dear friend. They're a very good machine if your grinder is set right. Don't listen to others you have to make your own mind up but remember the grinder is more important than the coffee machine. You are aware, I take it, that this thread is more than 5 years old? Love a good resurrected topic. Did the fete raise money? Did he go on to become a barista or roaster or DJ for that matter? Last edited by matth3wh; 7th June 2017 at 08:42 PM. Bames is still active on the site, he was last on 22 hours ago. Drop him a PM and ask that he update the thread! matth3wh, level3ninja and magnafunk like this.